“Use your brainwaves to help you rest, guided by soothing music and fading lights.” – The NeuroDreamer Sleep Mask by Cornfield Electronics is a meditation device that flashes colored lights at your eyelids and plays brainwave beats for your ears to help you fall asleep, have lucid dreams, or for meditation. NeuroDreamer is open source and CC-licensed and also designed by Adafruit friend Mitch Altman. The NeuroDreamer is open source, so it can be fun to explore the schematic diagram while looking at the physical device. The main board has a Zilog Z8F083A 8 bit microcontroller, similar to but less expensive than an Arduino chip, important for reducing cost of bill of materials for manufacturing many thousands of units. There’s a debug port for reprogramming, and various firmwares for the mask are available on the NeuroDreamer website! However you do need a ~$30 specialized Zilog programmer (but the software is free). At the bottom edge of the main board is the analog section for the speakers with capacitors and filter resistors for good quality audio. 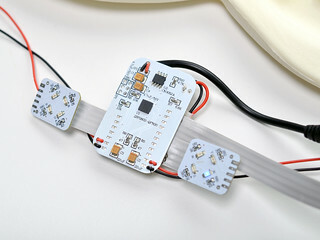 Two LED boards are connected via flex connector, with 4 LEDs on each (red, yellow, green, and blue). At the top edge of the main board is the battery charging circuit with a chip that controls charging so it doesn’t overcharge or over-discharge the sensitive lithium polymer battery. The device is comprised of four main sections: The outer dry-cleanable mask surface layer that comes in contact with your face and has velcro straps, the protective zippered mesh bag inside, the molded foam piece, and the electronic circuit inside. 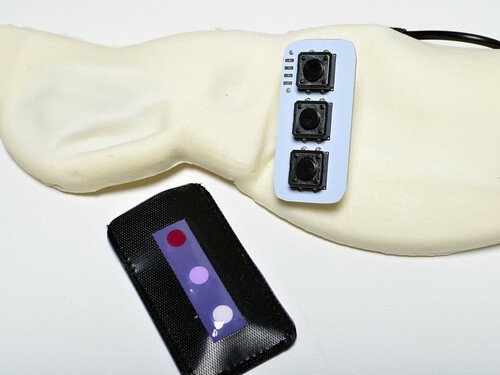 Sticking out of the molded foam piece is the button panel, which is just a PCB with three standard tactile switches inside a plastic and velcro sleeve. The tactile switch board is connected connected to the main board by a flex connector. The rest of the circuit is housed inside the molded foam piece, with only the DC charging cable sticking out. The foam piece has holes in the front, perhaps for allowing air circulation around the battery.